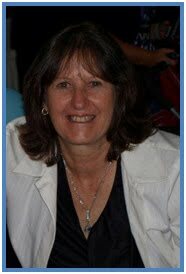 Long and Short Reviews welcomes Carol Marvell. Carol lives on a property outside the small country town of Childers, Queensland, Australia. "I love my hometown for its location and climate," she told me. "I am central to three small cities, all within forty-five minutes drive; Maryborough – famous for the author of Mary Poppins, Bundaberg – famous for Bundaberg Rum, and Hervey Bay – famous for Humpback whales and World Heritage listed Fraser Island, the biggest sand island in the world. I am only fifteen minutes from a junction of four rivers and half hour from the coast. All this gives me a wide variety of shopping, outdoor activities, movies, beaches etc." When she's not at her full-time job or writing, Carol loves fishing and camping. Every year the entire family (and sometimes a few additions) camps for a week on the beach of Fraser Island. "It’s great fishing off the surf beach," she assured me. "The other good part about it is that we spend quality time with the family without any distractions of the modern world. I also love going out in our boat fishing. We can either fish the nearby rivers or whiz down to the ocean. Gardening is another love of mine. I have a large garden and try to get out in it as much as possible. I have grown most of our plants from cuttings so it’s quite rewarding seeing them grow. Travelling is another passion. My husband and I have seen a lot of the world and still wish to see more. We’ve taken our children with us at times, and now that they’re old enough to appreciate it, they too have been bitten by the travel bug. I try to read as much as I can, but seem to only get time on my holidays. And then there’s my music. I love listening as well as playing it. I play bass guitar and a little bit of piano and rhythm guitar." Carol's writing started off as a hobby about twenty-five years ago, and she never had any intention of publishing. There weren't too many heroines around in books or movies. She grew up as a tomboy and always liked the action movies better than the romance stories, so she decided to create her own Aussie heroine. "I wanted someone who wouldn’t crumble at the first sign of trouble, someone strong in character and genuine in personality, and someone able to look after herself," she told me. "Hence Detective Billie McCoy stepped into my world." 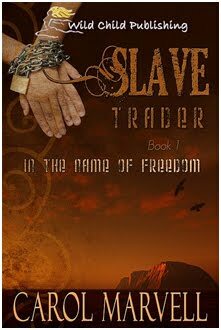 Carol's debut novel Slave Trader - In the Name of Freedom released this month from Wild Child Publishing, and she also has a contract with them for her second novel, the sequel to Slave Trader, Providence Road-In the Name of Friendship. "Although I can’t give you any hints to what happens in it, Providence Road is filled with just as much fast-paced action and twists as Slave Trader. The editing process does take time though, but I’m hoping it will be ready for publication in the near future. I am also working on my third novel that sees Billie in another adventure with new bad guys to take on." Carol actually created her main character, Detective Billie McCoy, and three of the other major characters before the story for Slave Trader took form. Once she had the idea for the story itself, she added in her villains and other characters as the story unfolded, feeding off it to guide her with new ideas and twists. As you can see, she is definitely a pantser. "I have never sat down and written an outline or tried to plot a storyline on paper," she admitted. "I start with an idea, which includes the main dilemma, and go from there. I build my characters and plot on the way. I never know how or where the story will lead or how it will end. I seem to make it up as I go, adding in characters, good or bad, as I need them. It makes it so much more exciting this way and quite rewarding when it all falls into place at the end. That’s the best thing about editing, you can change things at any time." "How do you keep your writing different from all the others that write in this particular genre?" I wondered. "With so many crime stories out there, I wanted something different, something that would break away from the usual run of the mill detective stories. Rather than have the theme of the cops chasing clues to solve a murder or some other crime, I took another path by dumping Detective McCoy in a heap of trouble and then following her struggle to get out of it. I have used plenty of action which delivers fast moving plots. Basically, my stories revolve around the good versus the bad, the desire to see justice done, all wrapped within an adventure that can lead anywhere. Amidst all the dramas, there is an element leaning towards the strength of friendships, unique friendships that tend to grow with each book. It is this unity that I feel shape my stories, developing my ideas and plots to work around this special camaraderie." Carol told me that she's never suffered from writer's block where she couldn't think of what to write. There have been times, however, when she has to think harder to get Billie out of some of the tight situations Carol leads her into. The stories just seem to flow for Carol and, when she's not writing, she can't get her stories out of her head—she's always thinking of ideas or developing schemes and strategies to either strengthen her existing work or create new ones. Actually, in most cases, coming up with the title is harder for Carol than actually writing the book. "Sometimes I feel I think too hard," she confessed. "I tossed over names for Slave Trader, bouncing them off my family, but couldn’t come up with anything I liked, or anything we all liked. And then all of a sudden, Slave Trader jumped out at me. I mean, that is what the book’s about – a modern day slave trade. It’s so easy in hindsight. Providence Road was just as frustrating. Again, as it should be, the title is related to an aspect of the story - the road they travel on when the slave traders transport their prisoners north. For the prisoners, their destiny, and fate, lies at the end of that road. I linked the two books together with their second titles – In the Name of Freedom, which concentrates on Billie and her fellow prisoners fighting for their freedom, and In the Name of Friendship, which focuses more on the development of unique friendships." She actually wrote both of these books several years ago and was surprised to find, after the release of Slave Trader, how extensive modern slavery actually is. "It is as real, brutal, and inhuman as any history book," Carold said. "Twenty-seven million people across the world could be considered slaves, and the industry of slavery and people trafficking makes $32 billion a year. The more I look into it, the more shocked I become. It is very frightening to know it goes on and that it is ranked among the top three revenue earners across the globe for organized crime, after drugs and arms." "What was the scariest moment of your life?" I wondered. "That would be the day I was diagnosed with breast cancer. It only took a few moments for my doctor to tell me the news. I didn’t hear much of what she said after that, and in fact, I had to revisit her the following day, with my husband by my side, to get all the facts again. That was back in 2005. The cancer proved to be quite aggressive (9 out of 12 lymph nodes in my arm were cancerous) which lead to instant surgery, followed by three months of chemotherapy and then six weeks of radiation. Within two weeks of starting my chemo, my hair started to fall out in clumps. No matter where I went, my hair was dropping into everything. It was quite overwhelming so I bit the bullet and asked my husband to shave it off. We started with a number two cut but that just made me look like a punk, so then we went the whole hog. Once I got used to the look, it wasn’t too bad. It was definitely cooler in summer. Through this ominous time, not only did I have the love and support of my wonderful family, I also had my writing which held a special place alongside them. I used my books to focus on. Editing kept my mind occupied, which helped to maintain a positive attitude and outlook. Seven years on, I am down to annual checkups, which so far, have all been clear. I take every day as it comes, every birthday as a blessing and I never complain about getting older anymore." In addition to her writing, Carol plays in a country rock band with her husband and two other guys. "It’s only a hobby band but we get a lot of fun out of it. We play at pubs, clubs, weddings and parties. I’ve been playing bass guitar since I was fifteen and joined my first band at the age of sixteen. I’ve never looked back. Even when I was pregnant, I was still out gigging until the last week. I had to rest my guitar on my hip because my belly was too big. It must have affected my children because they are all musical and have achieved qualifications up to 8th grade in violin. I’m also a member of a symphony orchestra playing, would you believe, electric bass. There are over fifty members and we play a wide variety of music. The orchestra is totally voluntary and we visit retirement villages and small towns to entertain the residents. They love it, especially the elderly who don’t get out very much." I live on a small property in Queensland, Australia. I work in a local primary school as a school officer / librarian and have recently taken on an additional role of Community Development Officer. Born in Childers, I grew up on a cane farm. Horses were my passion back then and I spent a lot of time in the saddle; riding with friends, pony club, shows etc. I met my husband on a beach at Hervey Bay - I was ten, he was eleven. Even though he lived in Sydney (a thousand miles away), he visited his grandmother every school holidays. My family had a holiday house around the corner from her, so we met up each holiday. We became good friends, and after he moved to Hervey Bay many years later, we were married. As he worked in the airlines, we could travel cheaply so saw a lot of the world, including Australia. I worked as a weighbridge clerk in a sugar mill. Both of our jobs revolved around shiftwork so at times we hardly saw each other. That’s when my writing took a firm hold. It was a means of taking my mind off being home alone in a big creaky house, particularly at night. At the same time, under this silence of the sometimes long hours, I had no interruptions to distract my thoughts. Once I was focused on my writing, nothing stopped me. We now have three beautiful children, two girls and a boy, and have just celebrated our 26th wedding anniversary. My husband is still my best friend and soul mate. Stretching from the streets of Sydney to the rainforests in far north Queensland, it’s a race against time. Filled with determination, disappointment and twists, the story follows Billie’s fight for freedom and her greatest ever challenge. She will need all her cunning and skill to get out alive and see justice done. Blood will be spilt, hopes will be destroyed – all to uncover a plot so unpredictable that only fate can decide . . . .
Great interview! Congrats on the book, sounds awesome. Rock band, huh? Cool. Thanks Cassie, and thanks for dropping by. Yes, I've been rockin' for many years and have had a lot of fun doing it. Great interview. Slave Trader sounds like an exciting read! Glad you liked it. Thanks Vicki. Great interview Carol. Sounds like you write like I do. I don't know what my mind will conjur next=) I just sent you a friend request. All of us WCP authors rock! Thanks Terri, and yes I accepted your friend request. I've only just set this facebook up and you were my first friend to join, just as you were with the facebook launch of Slave Trader. Pretty cool! That is pretty cool! When you're rich and famous best-selling author, I can say I was your first fan! You are a colorful woman, Carol! I love it. Great interview!